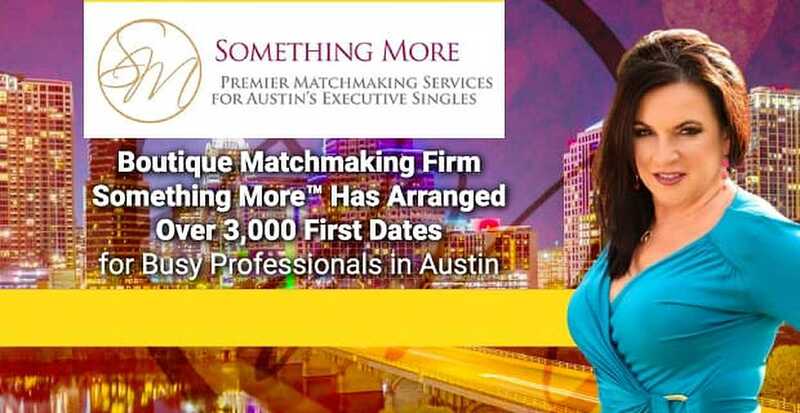 The Short Version: Something More is a luxury matchmaking service in Austin, Texas. The firm caters to working professionals who are single and sick of ghosting, swiping, and online dating in general. Since 2009, the company’s CEO Julia McCurley and her team of matchmakers have arranged over 3,000 first dates between relationship-minded men and women. They personally vet all date candidates and select individuals who are highly compatible with their clients. Once they’ve gotten the thumbs up from their clients, the concierge team sets up first and second dates and provides useful feedback along the way. Local singles can enhance their dating experiences and increase their odds of making a suitable match by joining Something More. Swiping isn’t a very satisfying way to date. You spend a couple seconds on each profile, making snap judgments and adding people to the reject pile for not knowing how to take a proper selfie or making a typo in their bios. Then, after all that decision-making and guesswork, you have to wait for mutual matches to respond and cross your fingers that they don’t flake out on the date. Singles today have limitless options but no direction. They have to figure out for themselves how to pick a date, flirt via text messaging, and make a good impression in a short span of time. It can be a lot to shoulder alone, which is why matchmakers have started picking up the slack by offering concierge dating services. In 2009, Julia McCurley set out to give single people a more personalized alternative to online dating. She was a former headhunter and believed she could use her recruitment skills to match people to quality dates instead of companies. She founded Something More, a premier matchmaking company, to provide singles with something more than a list of profile pictures and statistics. She wanted to give her clients a clear understanding of how dating works and what they can do to be successful. The Something More team offers its clients hand-selected dates, image consultations, and dating feedback as a way of giving men and women a leg up on the dating scene. These matchmakers don’t want a bad photo or a poorly worded profile to stand in the way of good relationships, so they do what they can to advise singles and help them choose their romantic partners in a more discerning manner. Something More is a boutique service that provides first-date vetting as well as post-date feedback. The matchmakers take the time to get to know their clients with an in-depth interview, and they conduct thorough background checks before setting up any dates. Julia said her team does their level best to knock every match out of the park. The matchmakers look beneath the surface when pairing people up and rely on their gut instincts to tell them which clients have a shot at making a relationship work, getting married, and starting a family. They don’t base their date recommendations on superficial traits, but on deep-seated compatibility. Something More serves an elite clientele of well-educated professionals in their 30s. Something More increases the likelihood of making a good match by drawing from its database of local singles as well as recruiting attractive date prospects throughout Texas. The matchmaking team will handle all the logistics of finding and setting up a date, so clients just have to show up and enjoy themselves. If both individuals want to see each other again after the second date, Something More will facilitate the exchange of contact information and let them take it from there. Once the first date is over, the work has only just begun for the Something More team. They talk to both individuals about how the date went and provide useful feedback to clients. This takes a lot of the uncertainty out of dating. Matchmaker Julia McCurley devotes a lot of effort to preparing her clients for the dating scene. Julia offers her clients straightforward guidance, so they know how to improve. She can’t promise that every date will lead to a relationship, but she can provide dating tips to help singles start out on the right foot. Something More gives singles the opportunity to learn and grow while meeting worthwhile and compatible date prospects. Julia said she has seen some singles hit it off on the first introduction and end up in a committed relationship, but more often than not the matchmakers have to work with clients more closely to get them to that point. Their job is to increase the chances that a first date will lead to a second date, so they don’t hold back when assessing their client’s dating strengths and weaknesses. Something More has helped over 500 singles meet people and gain confidence in the modern dating scene. Julia’s matchmaking business has grown through referrals, and she said she’s proud of the testimonials she has received from happily matched clients. “I would highly recommend Something More because you can tell they really do care about matchmaking.” — T.C. Online dating offers the instant gratification of searching for and finding available singles in your area, but it doesn’t help its members take those next important steps to establish chemistry and build a relationship. You have to do that yourself, and it can be a time-consuming process. Being surrounded by dating options often isn’t enough to get singles into a satisfactory relationship — and so Julia founded a boutique matchmaking company to offer modern singles a more tailored approach to finding love. Something More conducts an executive search for date prospects with long-term potential. The team looks beneath the surface to arrange dates between clients who have similar personality types, values, and goals. Julia has made thousands of introductions over the years, and she draws from that experience to help single folks reach their dating potential.